My World Record 20 Parrot Tricks in 2 Minutes has now received over one million views on youtube. I would like to thank everyone who watched that and my other parrot videos. But most of all, I would like to thank my regular readers and youtube viewers because if it weren't for them, I wouldn't be making all of these videos. It is because of their continual support that I have been motivated to put in all the work of capturing and presenting the parrot training that I normally do for my own pleasure anyway. How long did it take to teach Kili 20 tricks for the video? The video was taken in early January of 2010 while I acquired Kili in September of 2008. This would mean that I would have had Kili for about a year and four months by the time the video was recorded. Considering I didn't start training her immediately and that she had known these tricks for some months before I made the complete video, basically it took one year of consistent training to get her to that point. I estimate an average of an hour of training per day across that range would mean that I spent around 500 hours training her to be able to do that. Please don't forget that she knew 25 or closer to 30 behaviors by that point but I chose not to include some for lack of time. Why did you choose to do 20 tricks in 2 minutes? I wanted to create a high paced medley to show all of the tricks that Kili knew up till that point. I was having a hard time counting how many tricks she knew in total but I was certain she knew at least 20. I thought it would sound nice to do 20 tricks in 2 minutes and I knew it couldn't take much longer or I'd lose the viewers' attention span. So I simply set this as my goal and attempted it. I had no idea if it was possible or not until I began rehearsing it and doing some time trials with Kili. Originally it was taking closer to 3 minutes but with mistakes here and there so I was convinced that if I could move quickly and organize all of the props in order, I would be able to make it in 2. It took around 30 tries to get the performance required and in time. One of the difficulties was that she would have to do all 20 tricks accurately and quickly. If she messed up just one trick, whether in the beginning or the end of a run, the entire video was compromised. I wanted to show the entire sequence in a single uncut video so that people could see that a single parrot really did all those tricks in such a short time and without any fancy editing. What was the hardest part about making the 20 parrot tricks in 2 minutes video? Actually, believe it or not, the hardest part was for me to remember the order of all the tricks I had to cue Kili and when I could give her treats. I made a list of the tricks in order and highlighted the ones when there would be time to give her a treat. Unfortunately it wasn't big enough and I couldn't see it while I performed it. So I was messing up a lot at first with the order and that was slowing me down. One of the reasons we had to practice a lot was so that I could get the order right. Also I wanted Kili to get a bit accustomed to the order so she would be able to do it quicker as well. She was actually performing very well at first but beginning to lose focus by the time I got the take I would use. This is why I was caught assisting her with hand cues on a couple of the tricks cause it was the only way I could encourage her to do them quicker. I think it was on wings and turn around that I showed a hand cue in addition to verbal. In earlier takes I had her doing them strictly off the verbal cue but by the take I used, she wasn't opening her wings wide enough unless I showed her the signal. The training was complete by this point and Kili knew all the tricks well. The challenge was sooner to have her stay focused and perform quickly rather than demonstrate knowledge of the tricks themselves. Under a little bit less pressure and slower pace, Kili was able to perform all the tricks flawlessly. In fact I was a bit peeved that she did a fantastic run during practice but then wasn't doing as well for the video. There were a couple rough spots in the routine that ended up in the video. I would have liked to have perfected those but I was really tired and so was Kili after so many takes. I really didn't want to have to leave all the props out in their spots for yet another day so once I got a workable run through, I decided to call it quits. What's the song in the background? Was it playing during recording? The song is called Paradigm Shift by Liquid Tension Experiment. They are an instrumental offshoot from Dream Theater and make some incredible music. I chose the song to match the high paced excitement of doing the routine so quickly. The music was not playing during recording but was mixed in afterward. While the distraction may have been a concern, it was mainly that it sounds better if mixed on computer rather than through the microphone. I have trained Kili in the past with music playing or noisy environments so I know that she could do it. As long as she can see me and hear the cues she will perform if she is motivated enough. My then girlfriend, Kathleen helped me record the video. Following all of the action was no less of a challenge than performing the routine with Kili itself. I configured all the tricks around a semicircle so that the camera could follow me and the bird around and have the tricks be sequential. This was the only way to keep things moving quickly and show it all uncut. It took several takes to learn the camera tracking but fortunately that was perfected by the time the bird improved at the routine. Did you intend for the 20 parrot tricks video to become this famous? While I didn't have specific intentions or guesses at the magnitude of the popularity, I did hope this would be my most popular video. I was actually pretty disappointed that my Flighted Parrot Tricks Medley did not become popular. That was a well developed video that demonstrated a lot of advanced tricks involving flight but for some reason it just did not take off. It was meant to replace my Play Dead and Other Tricks video as an update of Kili's talents but just wasn't happening. So I set out to make an even more awe inspiring video. Surprisingly, the 20 parrot tricks in 2 minutes video didn't take off immediately either. Viewers liked it but didn't really give it much thought. It took over half a year until the video got really noticed and went viral on the internet. Now people are acting like they made an incredible discovery when they post the link. But really the video has been around a while and just wasn't so noticed before. Also it by no means Kili's most complicated video. I have videos where Kili does a four piece puzzle and another where she does 4 rings on peg by color. And these videos came way before 20 parrot tricks. So in some ways I actually had to dumb down her routine in order to be able to meet the target 2 minute time frame. I couldn't show the puzzle because it takes nearly a minute for her to complete. I reduced the rings on peg by color to just 2 for the video so that it still demonstrates a knowledge of colors but eliminates the delay. What treats are you feeding the parrot? She likes many foods so I can use any of a number of things. Often I just giver her seeds and stuff out of a typical parrot seed mix. Other times I'll give her apple, banana, almonds, peanuts, oatmeal, bread, popcorn, or even pellets as treats. She's not that picky. She just likes getting rewarded. However, in the video I think I mainly used little peanut crumbs as treats because they were the fastest treat she could swallow whole and yet motivating enough for her to work for them. Why did she take so long to flip the card? The issue was that it was getting too repetitive. I had run through the entire routine with her many times trying to improve the timing or get a perfect take. She was figuring out on which tricks she was getting the treats and which ones she wasn't. She knew damn sure she was not getting it after the card so she didn't want to do it. I later began making the rewards more random but it was still difficult to do because there were certain tricks I couldn't reward after in order to maintain the flow. The ideal way to do this is to practice with the treats coming completing at random so that the parrot has to attempt all the tricks to see when it gets the rewards. Is your parrot special or can any parrot do tricks like this? I don't believe that Kili was born with any special capabilities that any other Senegal Parrot would lack. She's a pretty ordinary parrot but I just took the time to teach her one trick after another. I'm not sure how the speed would work with other species but I think any parrot can learn 20 tricks. Duke the budgie had learned over 10 tricks and demonstrated 8 in under a minute. So if a parakeet can learn so many tricks, I don't see why any parrot couldn't do at least the same. Is the world record official? Is it in the Guinness Book of World Records? No, it's not an official. I don't know of any record keeping in regards to parrots anyway. I simply thought it would be cool to call it that because I have never seen any parrot come even close. 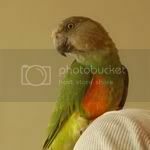 I have not met or seen a video of another parrot that could do 20 tricks period, let alone all 20 in just 2 minutes. Most parrots used in shows are actually far less skilled. They are often taught just a few tricks and then they interchange parrots based on the trick they want. 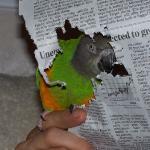 However, with Kili I wanted to show that a single parrot can know so many tricks and do any of them on cue. If anyone knows of a parrot that can do more than 20 tricks and/or quicker than in 2 minutes, I would definitely like to know. So what's next? Are you going to try to beat your own record? I am putting a lot of focus into training Truman right now and would like him to eventually be capable of the same routine. There are some new tricks I am testing on Kili but in the future I would like to do 15 tricks in 1 minute and using only a single treat. This wouldn't be a greater number of tricks shown but would demonstrate a quicker pace, fewer mistakes, and variable ratio reinforcement at its max. Ideally I'd like her to do the tricks for the sake of doing the tricks. How can I teach my parrot the 20 parrot tricks in 2 minutes routine? Well you've come just to the right place. I started the Trained Parrot Blog to share with everyone (for free) how I teach Truman all of the same tricks from the very start. You see with Kili, I never really recorded the training sessions. She was my first experience so I really didn't even know if the tricks would work. I simply recorded results as they came. However, having succeeded with Kili and Duke, I feel that these same techniques should work on Truman. He's become used to cameras/lights from the day I got him so he's by no means camera shy. I simply record all of my training sessions and then share the results here on my blog. So keep checking back and I will show you how I train Truman the 20 tricks routine all from scratch. There's no need to spend a fortune on books, dvds, seminars, or online programs because I'm willing to show you how I do it just for the hell of it. Feel free to subscribe to the blog so that you can receive email updates when new articles come out. I would recommend you get a set of parrot training perches because they make training much easier (particularly for flight) and you can see that I used one for the first portion of my trick routine in the video. Honestly that was the first time I have ever seen that video. Good job . Thanks for the in depth review of that excellent video. I watched that one more than once when you first posted it. I subscribed to your YouTube channel a long, long time ago. Everytime I get a subscription update I hurry over to YouTube to see what you've posted. I'm never disappointed. I'm sure glad that you make training information available to all of us - free of charge! That is unheard of anymore, and a huge bonus to all of us. Hope to see more of Truman in the future. After he heals from his injury of course. Hope he's doing well. Awesome video! You have such cute, well-trained birds. love the 20 in 2 video. I cant wait to see an update, or should I say upspeed? You actually gave me 100 good ideas about how to interact with my bird. The trainigvideo's was not what got me to the parrotforum, but it sure was one of the reasons for keeping me there. You and Killi are awesome. I cant wait to see Truman going through all the tricks. Me and my parrot will try to keep uo with you! Thanks for your write up on this vid, and I knew it would hit more than a mil! I've been watching the views go up and up since I first viewed it, which was around 1/2 mil. I found it when a fellow bird fan posted it to his facebook page then I did on mine. I don't know if you know this but it's not how many times the vid is viewed but how many ip addresses have viewed it--- so it's closer to number of individuals assuming majority aren't using shared computers to view it. I think most parrots can be trained but have to wonder if there are individual differences just like humans, how some of us can do some things and others can't. There may be Senegals out there who just aren't "equipped upstairs" to be able to learn much if at all.